None. Salvias need warm temperatures at all times. Mix a standard application of a balanced organic fertiliser into the soil prior to planting. In midsummer, drench plants with a liquid plant food to stimulate new growth. In containers, feed salvias every two weeks and do not allow them to dry out completely. In warmer areas, salvias can be used in open shade, where they work well with nicotiana and sprawling petunias. In containers, a single salvia can serve as the upright element, surrounded by mound-forming herbs or trailing flowers. Sow salvia seeds indoors in moist seed starting mix, and provide warm conditions and very bright light. 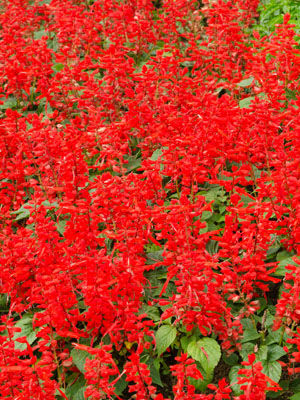 Most gardeners buy salvia seedlings, which are widely available as bedding plants. Salvias love warmth but not drought. Provide plenty of water, and be generous with liquid plant food. Red is the most common colour, but varieties are available in numerous colours and bicolours. Clip off old salvia branches after the flowers fade to insure steady production of new flowering spikes. Salvias make good short-lived cut flowers for garden bouquets. Whiteflies can be a problem, and are best managed with two or three sprays of insecticidal soap, seven to ten days apart.